It is without a doubt that there are quite a number of cafes, bars and even restaurant around Bangsar - Jalan Telawi. In fact, it's filled with it, and everyone knows that Bangsar is the place to drink and have a great time. 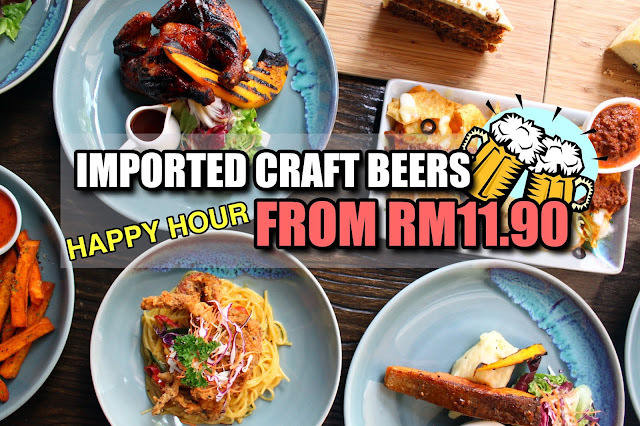 Similarly, here at The Briqs, you can enjoy Imported Craft Beer from ONLY RM11.90 per glass - that is definitely one of the most attractive points. 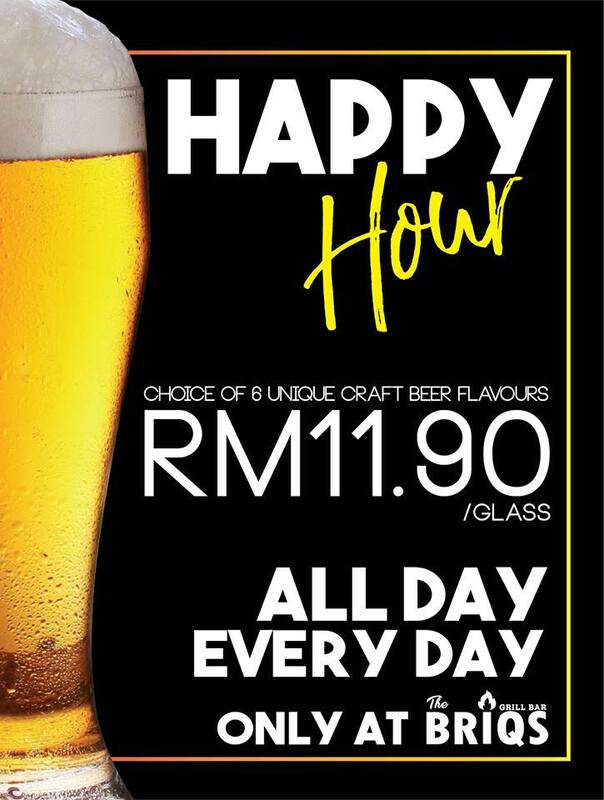 After all, there aren't many Craft Beer Bars around KL and it's great to be able to find one here at Bangsar. They currently offer 6 different types of craft beer from Bavara (Next to Germany & Austria). Wieninger Guidobald Gold, Wieninger Weissbier Dunkel, Camba Pale Ale, Gusswerk Das Schwarze Schaf Stout, Gusswerk Nicobar Ipa & Hofbrauhaus Traunstein Pilsner. Lager, Wheat, Pilsner, Ale, Stout & IPA - they have it all on tap. I've personally tried 3, and I can say for certain that I absolutely adore the Gusswerk Das Schwarze Schaf Stout. It's smooth, it has a rich chocolatey taste, and it really well balanced. That's one that I would highly recommened. If you love Guiness or Connors, you'll definitely enjoy this. The Camba Pale Ale too was really good. It has a slight fruity flavour, it's also quite rich but ultimately, it's quite refreshing. Kicking things off with the Cheesy Nachos, a generous portion of crispy tortilla chips topped with olives, jalapeno, cheese, mayo and of course, minced lamb ragout! A fantastic snack to pair with some really good craft beers. Nothing beats a simple yet flavoursome caesar salad, topped with poached egg, shredded cheese and turkey bacon! Apparently, I was told that this was one of the best-sellers for pasta, and after tasting it, I could see why. The pasta was creamy yet light, coated nicely with their own homemade salted egg sauce. To finish, a light yet crispy soft shell crab that just adds on depth and flavour to the dish. It's simple, but delicious. Briqs other specialty is their lamb burger. Though it doesn't look like much, the patty is well packed with flavour, served alongside fresh tomatoes, lettuce, cheese and a mint-yogurt sauce finished with a buttery brioche bun and sweet potato fries on the side. It's also pretty huge and definitely well worth the price. A balance of sweet & savoury, marinated deep within its bones. The Angus BBQ Back Ribs is a fantastic choice for any meat lovers in need of a juicy bite, served on a bed of mashed potatoes and grilled pumpkin, with a side of salad. The richness goes really well with a glass of Gusswerk Das Schwarze Schaf Stout. Beautifully roasted with a rich marinate, succulent and packed full of flavour. The Briqs' roasted spring chicken is definitely top of the list for anyone who's craving chicken. Heck, this works even better when it's shared amongst friends over a glass of beer. Roasted chicken with Lager? Awesome. A chunky portion of salmon pan-seared to crispy perfection on its skin, while maintaining a good amount of moisture on the flesh. It's also flaky, which makes it really easy to cut. The side of lemon butter sauce also complimented well with the salmon, and overall, it's a pretty good dish worthy of a praise. Quite surprisingly, The Briqs' dessert selection was absolutely delightful. Who would've thought that a bar could have such good cakes? The ambiance may not fit well with the 'dessert vibe', but their cakes are killing it. As much as I hate carrot cake, this was really moist and fluffy. It's not as dense and the flavour is well balanced. A good amount of carrot with hints of nuts, finished with a cream cheese icing - delicious! The Cheesecake as well was sinful. It's rich, creamy but incredibly light as well. I could keep going on for more without stopping. Truthfully, it's easily one of the top 10 best cheesecake that I've had in KL. These cakes are made by a Patisserie Baker exclusively for BRIQS, which is why it's that good! Overall, The Briqs offered more than what I'd expected. This simply grill-bar has an extensive range of food across its menu, with most of what I had being really good. 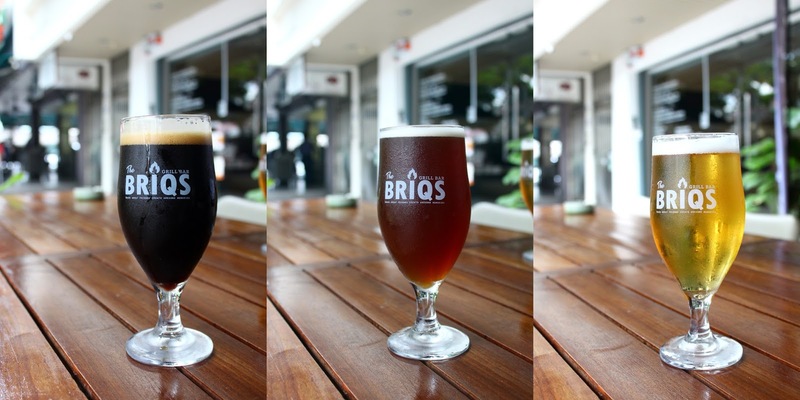 The specialty craft beers are also a must-try here at The Briqs as they are not only the cheapest in town, they're also the only one that offers it FRESH OFF THE TAP! BRIQS Grilled Bar surely seem to be one nice place to have some diet and grilled food. Thanks for sharing this healthy place to dine out when you're on a diet.